Dogs love nothing more than going for lovely long walks, happy to run on and on even when their panicking owner is already five minutes late for work and trying to tempt them home with the promise of biscuits. 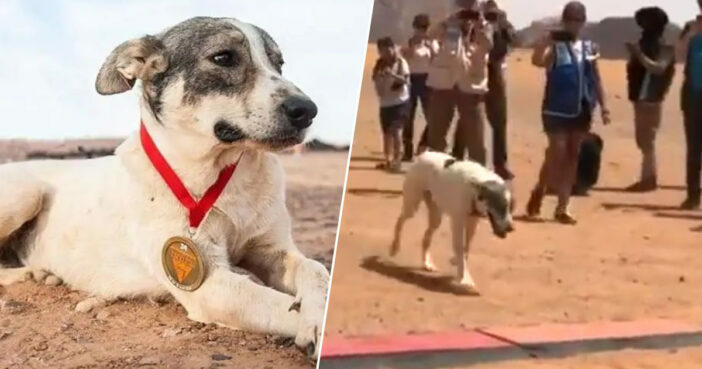 However, one very good boy has taken things to the next level, running for over 100 miles in the Sahara Desert heat alongside hardy racers in the famously grueling Marathon des Sables. The enthusiastic little dog – whose name is Cactus – joined the marathon runners during the second stage of the 140.7 mile marathon, finishing at a very respectable 52nd place out of approximately 800 runners. Bear in mind, the Marathon des Sables is known to be one of the toughest endurance tests on the planet, whether you’re on two legs or four. Athletic Cactus completed the third stage of the marathon in an extremely impressive four hours and 30 minutes. He finished the fourth stage in 11 hours and 15 minutes, battling a sandstorm while running. By the time the furry warrior reached the fifth stage, he was given his very own marathon number – 000 – with his new fans cheering him on as they followed his incredible progress through a tracking device. Fellow runners reportedly helped him out along the way by giving him water, while his social media fanbase tweeted words of encouragement. After he crossed the finishing line, Cactus was greeted with a well-deserved round of applause and his very own hard won medal. He has run more than 120 km and is in good shape! Is treated as a prince here at the camp. A very, very well done to Cactus. An inspiration and motivation to long walk loving dogs everywhere!